The sparkling new road diet on 7th Street east of Downtown; photo courtesy of Joe Anthony of Bike Commute News. According to Joe Anthony of Bike Commute News, the long-planned bike lanes on 7th Street west of Downtown appeared almost as if by magic over the weekend — despite not being expected for another month. Seventh has been my favorite route into Downtown for the past several months; a relatively lightly travelled four lane street where riders could easily take the lane. And usually hold it without too much difficulty. Now the street has undergone a road diet — and this time, there was a lot of outreach to the surrounding community, unlike some streets we could name. The result is, from the looks of it, a beautiful road with spacious bike lanes that extend well past the door zone. And one that presumably has support from the people who live and work along its route, unlike some streets we could name. I’ll be riding it myself later this week, so I’ll let you know what I think. But it looks like one of the city’s best kept secrets for riding in or out of Downtown just got a lot better. Update: In an earlier version of this story, I inadvertently said the bike lanes on 7th were east of Downtown; of course, they are west of Downtown. Thanks to Mike for catching my directionally challenged blunder. A soon-to-be-Angeleno asks for advice on where to live in L.A. where the riding is easy. I’m an east-coaster who loves the easy biking in Cambridge and Boston, MA for my 15 minute work commutes. My husband and I are moving out to the LA area and are considering what neighborhoods are the most bike friendly and have a decent amount of bike lanes. Any feedback would be much appreciated! I’m tempted to say that, aside from Long Beach and maybe Santa Monica, that kind of easy riding doesn’t exist yet in Los Angles. But what would you say? Any neighborhoods you’d recommend? Don’t ride your bike without lights at 2:15 am when you’ve been drinking underage. Then again, don’t get hit by a car when you’re riding with three times the legal blood alcohol limit. And don’t ride salmon without lights when you’re drunk, either. After a hit-from behind collision just minutes from Glacier National Park, a cyclist from my hometown is told that surgeons don’t see many patients like him. Because they’re usually dead. In pro news, Edvald Boasson Hagen wins the Eneco Tour, edging Phillippe Gilbert and David Millar, as biking prodigy Taylor Phinney just misses his first pro podium. After a disappointing Tour de France, Levi Leipheimer wins the Tour of Utah. Tour de France hero Johnny Hoogerland still struggles with the scars from his famous crash, emotionally and physically. U.S. cyclist David Clinger has been banned for life after testing positive for eating Spanish beef. Speaking of which, Alberto Contador will skip next years Giro to focus on reclaiming the tour de France, assuming he’s not banned for doping, uh, eating beef. A cyclist is repeatedly run off the road by a tow truck driver working for the city, yet the City Attorney says no harm, no foul — giving the driver tacit approval to do it again. Rethink North Figueroa this Friday. Richard Risemberg wisely says its time to stop complaining that the machine driving our cycling infrastructure is big, it’s time to start learning how to steer it. The Santa Monica Mirror looks at SaMo’s new Bike Action Plan; Bikeside’s Mihai Peteu likes what he sees. No bail for SaMo bike thieves busted with purloined bolt cutters. Cynergy Cycles unveils the 2012 BMC line on Thursday. Over 100 people gather on Manhattan Beach to remember 7-year old Jeremy Perez, who was killed by a grocery truck as he rode to visit his mother. The Claremont Cyclist revisits last week’s action at the Encino Velodrome. A Simi Valley cyclist with cerebral palsy plans to ride 500 miles to remember 9/11; maybe the challenges the rest of us face don’t look so big in comparison. A Bakersfield letter writer says the more you weigh, the more you should pay for road maintenance; I like it. Imperial Valley cyclists enjoy a ride by moonlight. Camarillo bike thefts have tripled in the past two months. The Ventura County Star endorses a Thousand Oaks bike lane project. 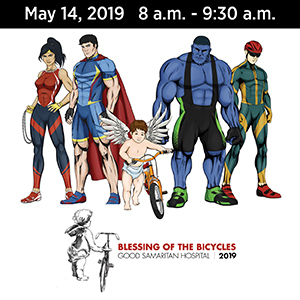 Lake Arrowhead will host their first Tour de Arrowhead on August 27th. 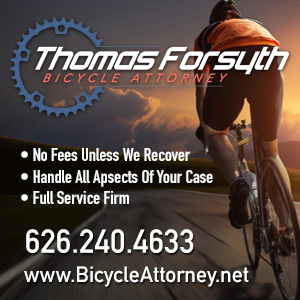 Newport Beach violates state law by banning bikes from Fernleaf Ave. Long Beach’s biking expats offer a little bike wisdom that’s proven true in my experience. San Francisco police respond to a recent tragedy by cracking down on red light runners, most of whom are cyclists. A San Francisco musician is gay bashed while riding his bike with a bandmate. Now that’s what I call a fuzzy bike. Ped and bike collisions spike in Alemeda. Palo Alto looks forward to a new bike bridge over the 101. Research shows bike-friendly cities are safer for all road users. 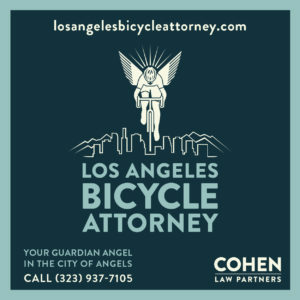 Bicycling offers a 108 point list of the rites of bike passage; the C-Blog lists his favorites. The infamous Black Hawk bike ban goes before the Colorado Supreme Court; how other Colorado towns say no to bikes. Michigan puts their road engineers on bikes; the real question is, why doesn’t everyone do that? An 84-year old Wisconsin cyclist rides 60 miles to promote lung health. New York’s Daily News takes yet another potshot at cyclists and NYDOT Commissioner Janette Sadik-Khan; the Brooklyn Spoke responds. A New York Times columnist hits the wall 500 miles into a cross country trip; thanks to George Wolfberg for the heads-up. The Virginia Bicycling Federation takes House Majority Leader Eric Cantor to task for attempting to put bike share on the chopping block. A Baltimore cyclist disregards studies showing it’s dangerous and encourages others to ride on the sidewalk; yes, neither studies nor common sense are true if you choose not to believe them. House star Hugh Laurie tours the Big Easy by bike. Florida police ticket children on their way to school for not wearing helmets. A fixie-riding DJ has become a hero of the London riots by providing accurate, real-time information. Two Israeli cyclists are killed and five injured when an 18-year old truck driver falls asleep at the wheel. Aussie cyclists say a planned off-road path will lead to road rage. Biking through Bhutan. Finally, a nice memory and good smile from Will Theisen at Cynergy. And if your pot patch is missing, you can blame a cyclist. The 7th St. bike lanes look great. 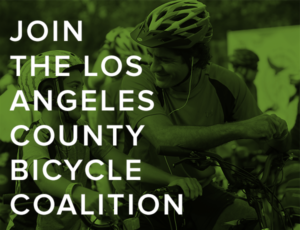 This should create a large jump in bicycling as it’s within two blocks of the busiest street in L.A. Also, the traffic will hopefully travel close to 30 mph, it’s in a densely populated area, and it heads downtown to the core of the city. From watching videos of bike infrastructure in several Dutch cities on ‘A view from the cycle path’ blog, this street comes close to where I’d expect to see bike lanes there. Not on the busy major arterial streets, but on a quieter street that people would feel comfortable riding, with no barrier to protect them from the motorized vehicles. The Dutch city of Zwolle uses bike lanes extensively on streets with lower traffic volume like 7th, instead of putting in a more expensive network of paths or cycle tracks on the busier arterial streets. Head down to MacArthur Park – the bike lane on 7th there is supposed to have a painted buffer space. I’m eager to see if anyone can confirm that a LA has built their first (albeit short) buffered bike lane. The picture is of 7th Street, just west of Hoover. Shouldn’t it be “west” of Downtown? Indeed it should. Stupid mistake on my part; thanks for catching it! Looks much nicer after the road diet. Check out the Street View image of 7th (facing East) as a comparison, back when it had four travel lanes.